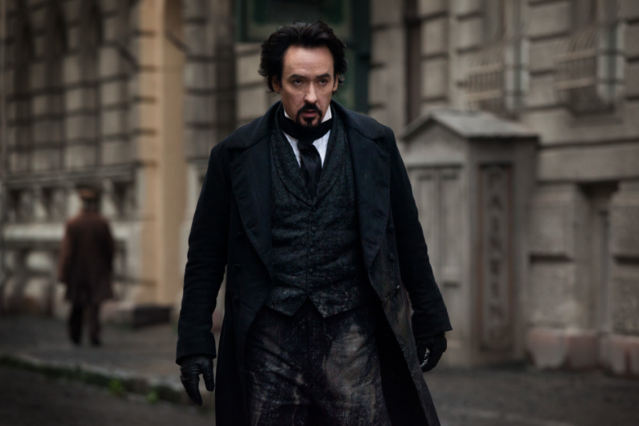 In his new movie The Raven, John Cusack plays Edgar Allan Poe, but this is no sober Victorian drama. Instead, Cusack’s Poe is enlisted by the Baltimore police to help solve a series of murders based on his stories. The movie, out today, is far from a solemnly reverent take on Poe and his work, but to help inhabit his character’s tortured psyche, Cusack often relied on music. The actor spoke with us about what he was listening to while making The Raven, Poe’s influence, and his own musical tastes. It’s interesting to see how many different kinds of musicians have looked to Poe for inspiration. It ranges from Iron Maiden to Antony and the Johnsons. Why do you think his appeal is so broad? I think a lot of people who don’t know Poe misunderstand him. He wrote in all these different forms, and he mixed and mashed different tones, and a lot of his writing was sensationalistic and burlesque and satirical. There was also an element of satire to his writing, and I think that’s what a lot of the musicians pick up on: there is sort of a shock jock vibe to Poe. You can see that vibe in everything from the Saw movies to Marilyn Manson. There is a wink and a nod at the aesthetics of doom. Is there any music that you think captures Poe’s essence particularly well? I sure do love The Raven by Lou Reed. Actually, I listened to that whole album when I was making the movie. I always make soundtracks when I make a movie. It keeps a thematic going for me, like a cord to the character. So I’ll listen to some music and I’ll have it always in my iPod and and I’ll take it through the different scenes. For The Raven I listened to that Lou Reed album and I was also kind of obsessively listening to Donovan’s “Hurdy Gurdy Man.” I thought that was all very Poe-like music. Specifically, though, what was it about the Lou Reed album that you found so inspiring? What I loved was that the album was inspired by Poe and it was Poe, but it was also another dream of Poe. It wasn’t trying to be a documentary. One of the things that’s so powerful about Poe — or any great artist that delves into the shadows — is that they write with the language of the subconscious, the dream nightmare language and all that stuff. So what I loved about Lou Reed was that he had his own dream of Edgar Allan Poe. He didn’t worry about being accurate. He even took the license to rewrite “The Raven.” He captured that feeling of being between waking and dreaming, and life and death, and sanity and insanity. That was Lou Reed’s dream of Poe. And this movie is our dream of Poe. And I hope other people have their dream of Poe. There are so many different dreams, you know? What else were you listening to when you made the movie? I think I might even still have a Raven playlist. Hold on, I can tell you what I had. Todos Santos — I was listening to Daniel Lanois at the time. Let’s see, what else? Superwolf by Bonnie “Prince” Billy was on there. I was listening to alt-rock mostly. Is that a departure for you? What do you normally listen to? No, I love that stuff. But I like everything. There’s not really any form of music I don’t like. I was also listening to you know Music to Start a Cult To by Gram Rabbit. They’re great. And I was listening to Bob Dylan’s Theme Time Radio Hour show. He did an episode dedicated to songs about the Devil that has some really good spooky, crazy songs. I would’ve thought goth would’ve been the obvious way to go if you were training to get into a Poe headspace. Did you ever have a goth phase? Oh yeah, sure sure sure. No doubt. Of course. When I was younger, Siouxsie and the Banshees. They were a little goth. But no goth on the Poe playlist? I’m sure there was some on there. Everyone could use a little goth now and then.